Long acting endectocide for sheep, contains 2% moxidectin. The only sheep injection to provide persistency against scab and worms in a single injection. Worm persistency up to 111 days, scab persistency 60 days. POM-VPS. A clear yellow liquid containing moxidectin 20 mg/ml as the active substance. Excipients: Benzyl alcohol 70 mg/ml. Treatment and prevention of mixed infections of gastro-intestinal nematodes, respiratory nematodes and certain arthropod parasites in sheep. Persistent efficacy periods have not been established for parasite species other than those included in the list above. Therefore, re-infection of animals on pasture contaminated by parasites other than these remains possible before the 44 day minimum persistency period demonstrated for specific species. Dosage is 0.5 ml/10 kg bodyweight to give 1 mg moxidectin/kg bodyweight. The 50 ml vial stoppers must not be broached more than 10 times. Use automatic syringe equipment for the 200 ml and 500 ml vials. To ensure administration of a correct dose, bodyweight should be determined as accurately as possible; accuracy of the dosing device should be checked. If animals are to be treated collectively rather than individually, they should be grouped according to their bodyweight and dosed accordingly, in order to avoid under- or overdosing. The injection should be administered as a single subcutaneous injection at the base of the ear using an 18 gauge, 25 mm hypodermic needle. With the animal's head under control, the formulation should be administered about 2cm caudal from the anterior (rostral) edge of the pinna at the base of the ear. The skin at the base of the selected ear should be pinched and the product injected into the subcutaneous tissue. Following subcutaneous administration, the needle should be withdrawn from the skin as pressure is applied with the thumb at the point of insertion for several seconds. If leakage occurs then pressure should be applied for several additional seconds. Do not use in sheep less than 15 kg bodyweight. Do not inject the product by the intravascular route. Intravascular injection may result in ataxia, paralysis, convulsions, collapse and death. See “Dosage and administration” section above. Do not use in cases of hypersensitivity to the active substance or to any excipients. Swelling and inflammation may be found at the injection site in some animals. The swelling generally disappears within 7 days of treatment and generally resolves without any medical treatment. In rare cases (more than 1 but less than 10 animals in 10,000 animals treated), adverse reactions such as transitory salivation, depression, drowsiness and ataxia might occur. No particular treatment is required; these symptoms usually disappear within 24 to 48 hours. There is no specific antidote. Signs of overdoses have not been seen at 3 and 5 times the recommended dose. However, if they do occur they should be consistent with the mode of action of moxidectin and would be manifested as transient salivation, depression, drowsiness and ataxia 24 to 36 hours post-treatment. The signs would usually disappear within 36 to 72 hours without treatment. There is no specific antidote. 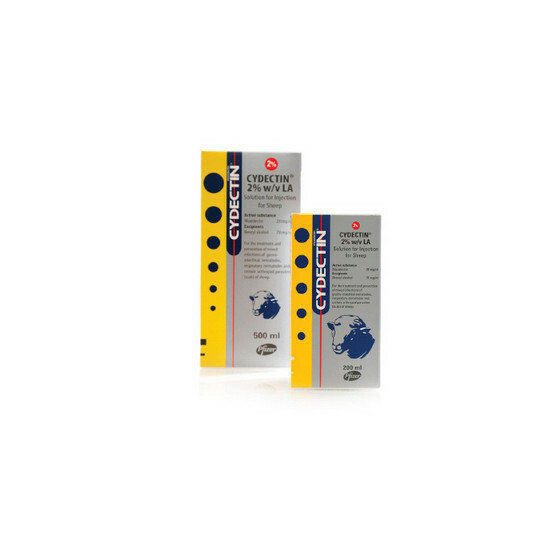 CYDECTIN 20 mg/ml LA for Sheep has been formulated specifically for subcutaneous injection in the base of the ear of sheep and must not be given by any other route of administration or to any other species. - Underdosing, which may be due to underestimation of bodyweight, misadministration of the product, or lack of calibration of the dosing device (if any). Resistance to macrocyclic lactones has been reported in Teladorsagia in sheep in a number of countries. In 2008, throughout Europe, moxidectin resistance is very rare; it has been reported in a single case involving a levamisole-, benzimidazole and ivermectin-resistant strain of Teladorsagia circumcincta. Therefore the use of moxidectin should be based on local (regional, farm) epidemiological information about susceptibility of nematodes, local history of treatments and recommendations on how to use the product under sustainable conditions to limit further selection for resistance to anthelmintics. These precautions are especially important when moxidectin is being used to control resistant strains. Meat and offal: 104 days. Milk: Not permitted for use in dairy sheep, at any stage of life. The withdrawal period is based solely on a single injection at the base of the ear. Avoid direct contact with skin and eyes. Wash hands after use. Do not smoke, drink or eat while handling the product. Take care to avoid self-injection. If this occurs, it is unlikely that any product related symptoms will be observed. Advice to Medical Practitioners in case of accidental self-injection: Treat symptomatically. Moxidectin fulfils the criteria for a (very) persistent, bioaccumulative and toxic (PBT) substance; therefore, exposure of the environment to moxidectin must be limited to the extent possible. Treatments should be administered only when necessary and should be based on faecal egg counts or evaluation of the risk of infestation at the animal and/or herd level. Do not use after the expiry date stated on the carton after "EXP". When the container is broached (opened) for the first time, using the in-use shelf life which is specified on this package leaflet, the date on which any product remaining in the container should be discarded should be worked out. This discard date should be written in the space provided on the label. Any unused veterinary medicinal product or waste material derived from such veterinary medicinal products should be disposed of in accordance with local requirements. Do not contaminate watercourses with the product. Extremely dangerous for fish and aquatic organisms. The product is packaged in 50 ml, 200 ml and 500 ml HDPE containers. Not all pack sizes may be marketed. Moxidectin is a member of the 3-ML anthelmintic class. Below are some recent questions we've received regarding Cydectin LA Injection For Sheep, including answers from our team. The dose is 0.5mls per 10kg bodyweight.